Kai sat on a red carpet, listening to the breeze blow through the bamboo. Most days he'd sit outside and many of the villagers came up the mountain to hear his words of wisdom and advice. One morning Ling-Si traveled up the mountain with a question for Kai. She saw him sitting on the carpet and walked over to him. "Kai, or wise master, I have a question for you." Kai held out his hand. "Sit and I will do my best to answer it." Ling-Si took a deep breath. "There's a proverb that says, 'Pick the flower when it is ready to be picked'." "I know that well, Ling-Si." He opened his mouth to answer, but couldn't think of anything to say. 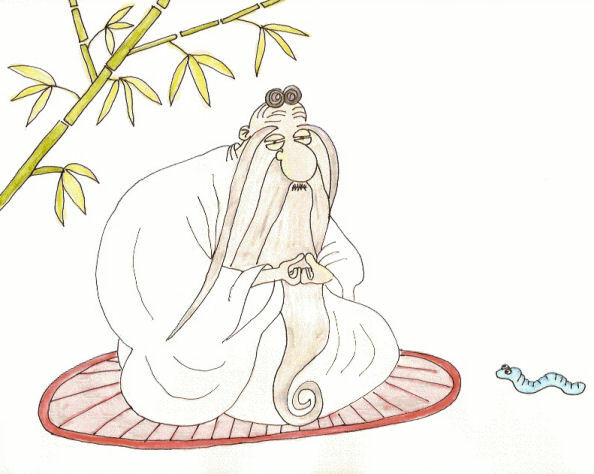 He scratched his chin, he twirled his beard and gazed up at the bamboo. Still, he couldn't think of any answer. "What is it, oh wise master. What is the answer. How will I know when the flower is ready?" Ling-Si sat patiently waiting. "I will have to think about it, Ling-Si. Go home and return in seven days. I will have an answer for you," Kai said. Ling-Si bowed and went home. All day long Kai thought about the question. The next day he thought about it and the day after that. No matter how hard he tried, he couldn't think of an answer. On the morning that Ling-Si was to return, a small blue worm crawled up to Kai. "Good morning, worm. It is good to see you. I have a perplexing problem that you may be able to help me with." The worm bowed it's head. "What can I help you with, master Kai?" "Ling-Si is coming to visit me today and expects an answer to her question, but I have no answer." "What is the question, Kai?" The worm moved closer. "The question is, how will she know when the flower is ready to be picked." Kai sighed. "I am getting old, blue worm. Perhaps it is time for me to wander off and let another take my place." "The answer to your question is, the flower is ready to be picked when its fragrance stays on your hand." The blue worm smiled and nodded. "The girl is coming. I will hide." Ling-Si walked up to Kai. "It was a long walk this morning, master. I hope you have an answer to my question." The girl sat in front of Kai. "The answer to your question is, the flower is ready to be picked when its fragrance stays on your hand." "Thank you, master. I will return home." Ling-Si ran off down the mountain. "Blue worm, it is time for me to wander the mountains of China. You shall be the new master." Kai stood and let the blue worm sit on the red mat. He bowed and then Kai wandered off, as the breeze blew through the bamboo and crickets chirped.